“Something Unique” according to Ute Native American legend to some. 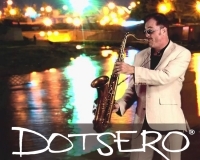 It means DOT-ZERO on the earliest geographical railroad maps to others, but to jazz fans worldwide DOTSERO means Contemporary Jazz at its best, full of life energy and spontaneity that few artists in the genre have been able to match. A no nonsense sax and guitar driven thrill ride of energy and excitement. As much fun to watch as they are to listen to. The band has performed at major jazz festivals; Red Rocks Amphitheatre, JVC Winter Park Jazz Fest, Jazz Trax Catalina Island Jazz Fest and The Cancun Jazz Festival, among others. From Ala Carte Ala Park in San Francisco to West Palm Beach’s Sunfest, DOTSERO has crisscrossed the nation performing their exciting brand of jazz.